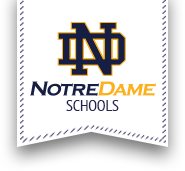 Notre Dame is committed to an athletic program of excellence, as a player or a spectator athletics is an important part of their high school experience. Through athletics, students learn how to function as a team, sportsmanship, friendly competition, self-discipline and respect for others. At Notre Dame students develop not only as an athlete but as a person as well. We believe that no one works harder, or practices harder than we do. We strongly value our student-athletes, letting them know that academics always come first. Athletics is a significant tool in the educational process of character development and encourages students to lead by example. With such preparation, we aim to set them up for success as they strive to play sports in their college careers. Many of our alumni have had rewarding collegiate athletic experiences in a variety of sports. Notre Dame has had many great achievements. We have won nearly 70 NYS Section III Championships. We have also won four State Championships; Girls Varsity Basketball in the 1982-83 and 2013-14 seasons and Boys Varsity Baseball in the 2001 and 2005 seasons. For up-to-date sports scores, please visit TVL Sports Central. Please note a form has been provided below for sports physicals, however, we will accept a physician's own form as long as it includes the date, approval and physician's signature.